I saw in the footnotes of a book about Frenštát that it didn’t even make it onto Jan Amos Komenský’s 1633 map, no doubt having been destroyed during a siege during the Thirty Year’s War. Well, that author was correct. It’s not on the map. I was curious to find out if that was true, about it being destroyed during the war. And at the same time, I was trying to research something completely different which required me to figure out, “What is the oldest land book in Frenštát?” I found it with some help, but then I was skeptical and decided to search again. And that’s when I found this! Anyway, here are some of the first entries, with more to come I am sure. Thanks to Lukáš for helping me read them. Dne 6 January. Učinil vpád do městečka Frankštadu Mansfeld a to městečko zraboval a chudý lid o všecko připravil, škody na tisíce učinil. 6 January. Mansfeld raided the town of Frenštát and plundered the city. And he robbed the poor people of everything, [and] he has incurred damage of thousands [of unspecified currency unit]. Leta paně 1645. Panovalo morové povětří v městečku Frankstatě od svaté Máří Magdaleny do svatého Martina. kteroužto morovou ranau přes [some number] patnácte osob, obojího pohlavi jest zemřelo. The year of our Lord 1645. There was plagued air in the town of Frenštát from St. Marie Magdalena [July 22] to St. Martin [November 11], by which plague more than ??? and fifteen people of both sexes died. Léta páně 1646 dne 6 7bris. Švéda a lid [something] zlodějský na úsvitě vpadnuvše do městečka Frankstadt kde co bylo všechno pobral lidi do naha zvlácel [mor]doval, za mnoho tísic škody učinil. Jejichžto duše za to propůjčí Pán Bůh všemohoucí království nebeské. A Švedskym peklo horoucí. On the year of our Lord 1646 on 6 September. 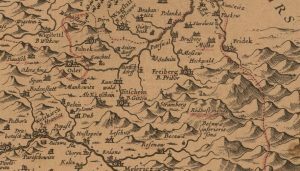 Swedes and thieves descended on the town of Frenštát at dawn where they were dragged until naked [by horses?] until they were slain, and inflicted damage of thousands [of unspecified currency unit]. The Almighty God awards to their souls the Kingdom of Heaven. And to the Swedes a fiery hell.